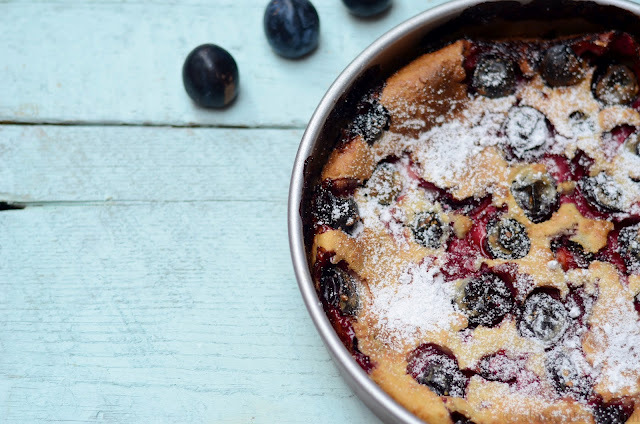 A couple of years ago I made a French batter pudding called Clafoutis using fresh cherries. 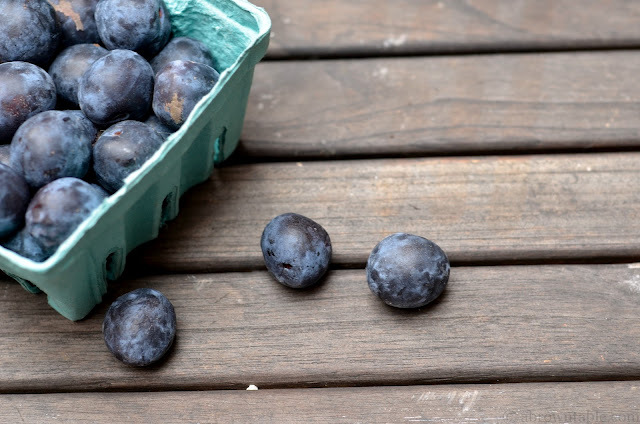 Though cherries are traditionally used to make this pudding, I figured that these sweet delicious Damson plums would be perfect in this pudding. 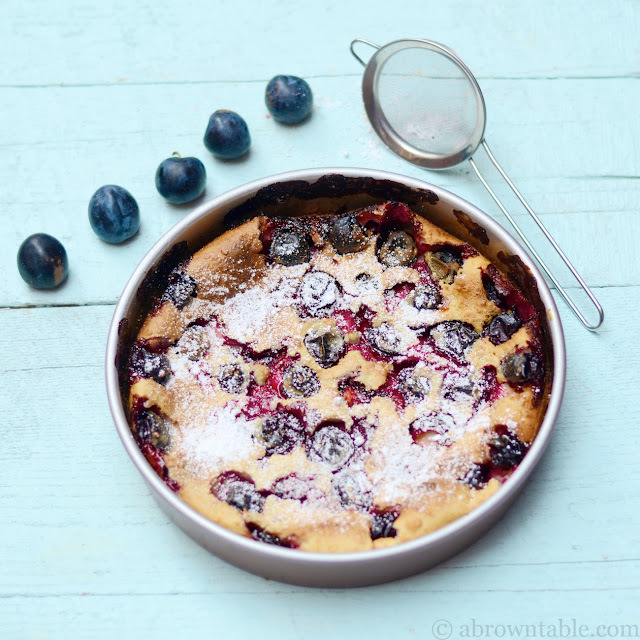 A couple of years ago I made a French batter pudding called Clafoutis using fresh cherries. 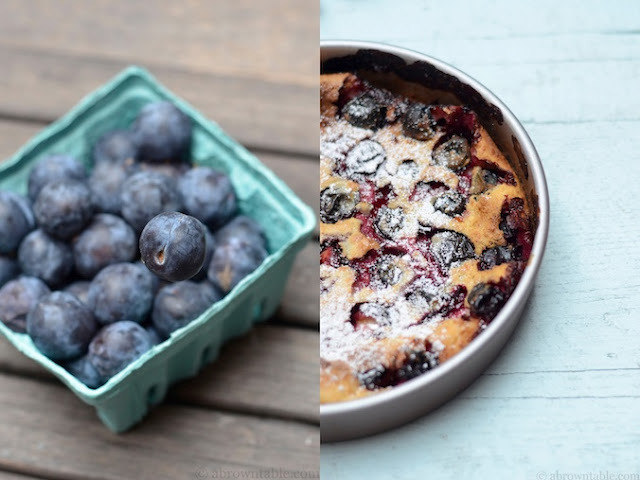 Though cherries are traditionally used to make this pudding, I figured that these sweet delicious Damson plums would be perfect in this pudding. I like this pudding because it is easy and simple. It also has a very beautiful rustic look to it and the colors of the fruit juices spread through the pudding forming little delicious red craters. This batter pudding will rise during baking in the oven and then slowly sink as it cools. You should serve it warm with a generous dusting of icing sugar. It also goes wonderful with hot tea or coffee. This recipe has been adapted from "The Essential Mediterranean Cookbook". Preheat the oven to 350F. Lightly grease a 9 inch diameter baking pan with the butter. Wash and slice the plums, remove and discard the pit from the center. Flip each plum and place the skin side upwards in the greased pan. Cover the base of the pan with the plums in a single layer. Sift the flour once in a mixing bowl, break open the eggs and add to the flour. Whisk until smooth. Add the sugar, milk, cream, and melted butter by whisking until completely combined. Do not overbeat the batter. Pour the batter over the cherries and bake for 40 minutes or until a skewer comes out clean when inserted into the center. Allow the pudding to cool for at least 15 minutes before serving. It should be warm but not hot before serving. Generously dust the icing sugar over the clafoutis before serving.